The Congress of the Philippines (Filipino: Kongreso ng Pilipinas), is the national legislature of the Philippines. It is a bicameral body consisting of the Senate (upper chamber), and the House of Representatives (lower chamber), although colloquially, the term "congress" commonly refers to just the latter. The Senate is composed of 24 senators  half of which are elected every three years. Each senator, therefore, serves a total of six years. The senators are elected by the whole electorate and do not represent any geographical district. The House of Representatives is currently composed of 297 congressmen. Sec. 5 Art. VI of the Constitution states that the House "shall be composed of not more than 250 members, unless otherwised fixed by law..." There are two types of congressmen: the district and the sectoral representatives. The district congressmen represent a particular geographical district of the country. All provinces in the country are composed of at least one congressional district. Several cities also have their own congressional districts, with some composed of two or more representatives. The sectoral congressmen represent the minority sectors of the population. This enables these minority groups to be represented in the Congress, when they would otherwise not be represented properly through district representation. Also known as party-list representatives, sectoral congressmen represent labor unions, rights groups, and other organizations. The Constitution provides that the Congress shall convene for its regular session every year beginning on the 4th Monday of July. A regular session can last until thirty days before the opening of its next regular session in the succeeding year. The President may, however, call special sessions which are usually held between regular legislative sessions to handle emergencies or urgent matters. When the Philippines was under colonial rule as part of the Spanish East Indies, the colony was not given representation to the Spanish Cortes. It was only in 1809 where the colony was made an integral part of Spain and was given representation in the Cortes. On March 19, 1812, the Constitution of Cádiz was approved, which led to the colony's first representatives at the Cortes in September 24, 1812 by Pedro Pérez de Tagle and José Manuel Coretto. However, with Napoleon I's defeat at the Battle of Waterloo, his brother Joseph Bonaparte was removed from the Spanish throne, and the Cádiz Constitution was replaced by the Cortes on May 24, 1816 with a more conservative constitution that removed Philippine representation on the Cortes, among other things. Restoration of Philippine representation to the Cortes was one of the grievances by the Illustrados, the educated class during the late 19th century. The Illustrados' campaign transformed into the Philippine Revolution that aimed to overthrow Spanish rule. Proclaiming independence on June 12, 1898, President Emilio Aguinaldo then ordered the convening of a revolutionary congress at Malolos. The Malolos Congress, among other things, approved the 1899 Constitution of the Philippines. With the approval of the Treaty of Paris, the Spanish sold the Philippines to the United States. The revolutionaries, attempting to prevent American conquest, launched the Philippine–American War, but were defeated when Aguinaldo was captured on 1901. When the Philippines was under American colonial rule, the legislative body was the Philippine Commission which existed from 1900 to 1907. The President of the United States appointed the members of the Philippine Commission. Furthermore, two Filipinos served as Resident Commissioners to the House of Representatives of the United States from 1907 to 1935, then only one from 1935 to 1946. The Resident Commissioners had a voice in the House, but did not have voting rights. The Philippine Bill of 1902 mandated the creation of a bicameral or a two-chamber Philippine Legislature with the Philippine Commission as the Upper House and the Philippine Assembly as the Lower House. This bicameral legislature was inaugurated in 1907. Through the leadership of then Speaker Sergio Osmeña and then Floor Leader Manuel L. Quezon, the Rules of the 59th United States Congress was substantially adopted as the Rules of the Philippine Legislature. In 1916, the Jones Law changed the legislative system. The Philippine Commission was abolished, and a new bicameral Philippine Legislature consisting of a House of Representatives and a Senate was established. The legislative system was changed again in 1935. The 1935 Constitution, aside from instituting the Commonwealth which gave the Filipinos more role in government, established a unicameral National Assembly. But in 1940, through an amendment to the 1935 Constitution, a bicameral Congress of the Philippines consisting of a House of Representatives and a Senate was created. Those elected in 1941 would not serve until 1945, as World War II erupted. The invading Japanese set up the Second Philippine Republic and convened its own National Assembly. With the Japanese defeat in 1945, the Commonwealth and its Congress was restored. The same set up will continue until the Americans granted independence on July 4, 1946. Upon the inauguration of the Republic of the Philippines on July 4, 1946, Republic Act No. 6 was enacted providing that on the date of the proclamation of the Republic of the Philippines, the existing Congress would be known as the First Congress of the Republic. Successive Congresses were elected until President Ferdinand Marcos declared martial law on September 23, 1972. Marcos then ruled by decree. Marcos was overthrown after the 1986 People Power Revolution; President Corazon Aquino then ruled by decree. Later that year she appointed a constitutional commission that drafted a new constitution. The Constitution was approved in a plebiscite the next year; it restored the presidential system of government together with a bicameral Congress of the Philippines. It first convened in 1987. 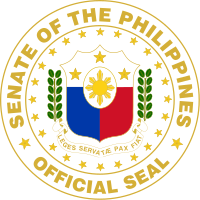 The Senate, when it is in existence, is always composed of 24 senators, including vacancies. The 1935 constitution abolished the Senate, but a 1940 amendment restored bicameralism. The 1978 constitution, the Senate was abolished a new in favor of a unicameral parliament; it was restored with the approval of the 1987 constitution. 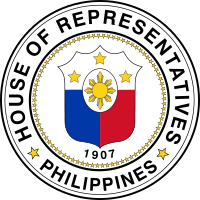 The House of Representatives (National Assembly/Batasang Pambansa) originally had 98 members; the 1935 Constitution limited the membership to 120. The adoption of the 1973 Constitution raised the membership to 200, while the 1987 constitution allowed increases from the 250-seat limit by means of statutes. Members of Congress often switch parties in favor of the ruling president after the election in what is locally known as the Padrino System or patronage politics; this phenomenon is more pronounced in the lower house, causing the president to automatically hold at least one chamber at any given time. It is essential to the effective exercise of other powers expressly granted to the assembly. to keep journal of its proceedings; etc. It has reference to powers which the Constitution expressly and specifically directs to perform or execute. To prescribe rules and procedure to be followed; etc. Elect the President in case of any electoral tie to the said post. To decide electoral protests of its members through the respective Electoral Tribunal. To establish independent economic and planning agency. The Member or the Bill Drafting Division of the Reference and Research Bureau prepares and drafts the bill upon the Member's request. The bill is filed with the Bills and Index Service and the same is numbered and reproduced. Three days after its filing, the same is included in the Order of Business for First Reading. On First Reading, the Secretary General reads the title and number of the bill. The Speaker refers the bill to the appropriate Committee/s. The Committee where the bill was referred to evaluates it to determine the necessity of conducting public hearings. If the Committee finds it necessary to conduct public hearings, it schedules the time thereof, issues public notices and invites resource persons from the public and private sectors, the academe, and experts on the proposed legislation. If the Committee determines that public hearing is not needed, it schedules the bill for Committee discussion/s. Based on the result of the public hearings or Committee discussions, the Committee may introduce amendments, consolidate bills on the same subject matter, or propose a substitute bill. It then prepares the corresponding committee report. The Committee approves the Committee Report and formally transmits the same to the Plenary Affairs Bureau. The Committee Report is registered and numbered by the Bills and Index Service. It is included in the Order of Business and referred to the Committee on Rules. The Committee on Rules schedules the bill for consideration on Second Reading. The amendments, if any, are engrossed and printed copies of the bill are reproduced for Third Reading. The engrossed bill is included in the Calendar of Bills for Third Reading and copies of the same are distributed to all the Members three days before its Third Reading. On Third Reading, the Secretary General reads only the number and title of the bill. A roll call or nominal voting is called and a Member, if he desires, is given three minutes to explain his vote. No amendment on the bill is allowed at this stage. The bill is approved by an affirmative vote of a majority of the Members present. If the bill is disapproved, the same is transmitted to the Archives. The approved bill is transmitted to the Senate for its concurrence. The bill undergoes the same legislative process in the Senate. A Conference Committee is constituted and is composed of Members from each House of Congress to settle, reconcile or thresh out differences or disagreements on any provision of the bill. The conferees are not limited to reconciling the differences in the bill but may introduce new provisions germane to the subject matter or may report out an entirely new bill on the subject. The Conference Committee prepares a report to be signed by all the conferees and the Chairman. The Conference Committee Report is submitted for consideration/approval of both Houses. No amendment is allowed. Copies of the bill, signed by the Senate President and the Speaker of the House of Representatives and certified by both the Secretary of the Senate and the Secretary General of the House, are transmitted to the President. If the bill is approved by the President, it is assigned an RA number and transmitted to the House where it originated. The bill is reproduced and copies are sent to the Official Gazette Office for publication and distribution to the implementing agencies. It is then included in the annual compilation of Acts and Resolutions. The message is included in the Order of Business. If the Congress decides to override the veto, the House and the Senate shall proceed separately to reconsider the bill or the vetoed items of the bill. If the bill or its vetoed items is passed by a vote of two-thirds of the Members of each House, such bill or items shall become a law. Election of the president in case of a tie vote. In most cases, such as the approval of bills, only a majority of members present is needed; on some cases such as the election of presiding officers, a majority of all members, including vacant seats, is needed. In the Philippines, the most common way to illustrate the result in a Senate election is via a tally of candidates in descending order of votes. The twelve candidates with the highest number of votes are elected. Reference: Commission on Elections sitting as the National Board of Canvassers. For party-list election results, see Philippine House of Representatives election, 2016 (party-list). A voter has two votes in the House of Representatives: one vote for a representative elected in the voter's congressional district (first-past-the-post), and one vote for a party in the party-list system (closed list), the so-called sectoral representatives; sectoral representatives shall comprise not more than 20% of the House of Representatives. To determine the winning parties in the party-list election, a party must surpass the 2% election threshold of the national vote; usually, the party with the largest number of votes wins the maximum three seats, the rest two seats. If the number of seats of the parties that surpassed the 2% threshold is less than 20% of the total seats, the parties that won less than 2% of the vote gets one seat each until the 20% requirement is met. The Legislative Building during the 1930s. Locations of the historical (blue) and current (red) seats of Congress in Metro Manila. In what could be a unique setup, the two houses of Congres meet at different places in Metro Manila, the seat of government: the Senate sits at a building shared with the Government Service Insurance System (GSIS) at Pasay, while the House of Representatives sits at the Batasang Pambansa Complex. The Barasoain Church in Malolos, Bulacan served as a meeting place of unicameral congress of the First Philippine Republic. After the Americans defeated the First Republic, the US-instituted Philippine Legislature convened at the Ayuntamiento in Intramuros, Manila from 1907 to 1926, when it transferred to the Legislative Building just outside Intramuros. In the Legislative Building, the Senate occupied the upper floors while the House of Representatives used the lower floors. Destroyed during the Battle of Manila of 1945, the Commonwealth Congress convened at the Old Japanese Schoolhouse at Sampaloc. Congress met at the school auditorium, with the Senate convening on evenings and the House of Representatives meeting every morning. Congress would return to the Legislative Building, which will be renamed as the Congress Building, on 1949 up to 1973 when President Marcos ruled by decree. Marcos built a new seat of a unicameral parliament at Quezon City, which would eventually be the Batasang Pambansa Complex. The parliament that will eventually be named as the Batasang Pambansa (National Legislature), first met at the Batasang Pambansa Complex on 1978. With the overthrow of Marcos after the People Power Revolution, the bicameral Congress was restored. The House of Representatives inherited the Batasang Pambansa Complex, while the Senate returned to the Congress Building. On May 1997, the Senate moved to the newly constructed building owned by the GSIS on land reclaimed from Manila Bay at Pasay; the Congress Building was eventually transformed into the National Museum of the Philippines. ^ "Article VI: THE LEGISLATIVE DEPARTMENT". Philippines Official Gazette. Retrieved May 31, 2013. ^ "The Legislative Branch". Philippines Official Gazette. Philippines Official Gazette. Retrieved May 31, 2013. ^ "NBOC Resolution No. 007-16" (PDF). Commission on Elections en banc sitting as the National Board of Canvassers. May 19, 2016. Retrieved May 22, 2016. ^ "2016 Official Senatorial Election Results". Rappler & Commission on Elections en banc sitting as the National Board of Canvassers. May 19, 2016. Retrieved May 22, 2016.